Note that when this picture was taken the British counted roughly a million Palestinians in British Mandate Palestine, scheduled to achieve statehood as Palestine when the British left. The British likely did not count the Bedouins in their statistics and probably under-counted the Palestinians in general. When the picture was taken there were roughly 175,000 Jews in Palestine, most recent immigrants from Europe, and almost none of them in what is now the West Bank. “Bedouins who live today in the West Bank have their roots in the Naqab (Negev) desert, which they were forced to leave in 1948, being victims of the violence. This significant event in essence ruptured their Bedouin lifestyle and severely restricted their former freedom of mobility to search for pastures and water for their herds of sheep and goats. As a consequence, these Bedouin communities began to lose not only their livelihood but their cultural identity as well. They had to confront the brutal reality that they had become refugees. The 1967 Israeli occupation displaced them again, and they were forced to settle in the rural areas around Hebron, Bethlehem, Jerusalem, Jericho, and the Jordan Valley. As they tried to adapt to this abrupt change, many features of the Bedouin lifestyle underwent a radical transformation. 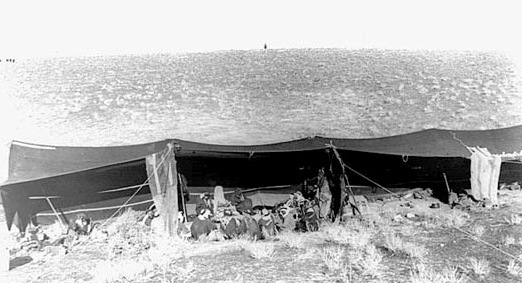 For example, the goat-hair tent has become a dwelling consisting of poor metal shelters that are constructed using old water containers. Overcrowded camps have become the norm, where people and animals share a very limited space that has no running water, sewage system, or electricity. Bedouin shepherds have become semi-urban impoverished inhabitants who are forced to have a sedentary lifestyle. Their knowledge and ancient expertise as animal breeders are utterly useless within a modern urban habitat. The Bedouins have become a minority group who are disdained by some members of society. What has happened to Bedouins today? In order to find out, we will begin with the area around Jerusalem. The Israeli settlement of Ma’aleh Adumim was built on an area formerly inhabited by the Jahaleen tribe. The Jahaleen were evicted by the Israeli Civil Administration, supported by police and army forces.